Corporate Logo | Xylem Inc. The Xylem logo is a vital expression of our new brand identity. Its color is, naturally, blue, the color most closely associated with water. Its letters were designed to remind us of the flow of water and the precision of our engineering focus. It is a modern design, appearing in all lower-case letters to create a friendly, inviting feeling that builds interest. These elements work together to show that we’re creative, thoughtful problem-solvers. 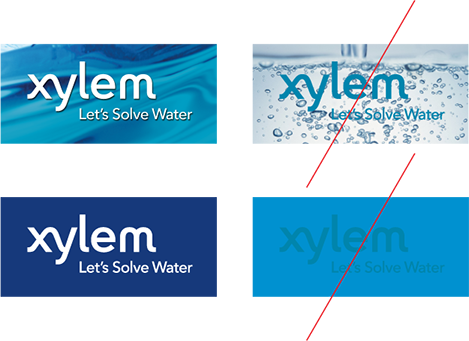 There are two configurations of our logo: the Xylem logo and the Xylem logo with tagline. Each configuration represents carefully drawn artwork that should not be altered or modified in any way. Always use the Xylem logo with the tagline except in instances when the tagline would be too small to easily read, such as in signage, embroidery or on small promotional items such as pens (see “Minimum size”), or in the case of a non-water industry communication tool, for example on a tradeshow banner or industry advertisement. Also use the Xylem logo without tagline when legal requirements are in place that prohibit use of English language taglines (e.g., in Quebec, Canada). We strongly discourage the creation of new logos for departments or projects. We have our Xylem corporate logo and our product logos, which collectively amount to more than 40 brands. There is no value added to the company by creating additional “internal” logos. The Xylem logo and tagline are never to be translated. It is important to surround our logo and tagline with a healthy amount of breathing room. This helps it stand out in our communications. Avoid placing any text or graphic elements within the designated clear space. Clear space is equal to the x-height of the logotype. To ensure that our logo and tagline are always legible, we have developed recommendations for the smallest size at which it can be safely reproduced for print and onscreen applications. There are three color variations of our logo, each designed with a specific purpose. These are the only color variations approved for use. This is the preferred variation of our logo. It can be placed on white or light-color backgrounds. Use this variation when background color or imagery adversely affects the legibility of the Xylem Blue logo. Use of this variation is limited to one-color or two-color printing where Xylem Blue is not available or in material treatments (e.g., fax, stamping, embossing, embroidery). 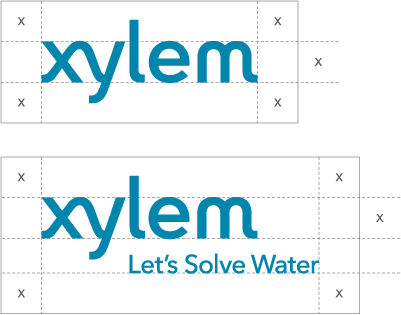 It is acceptable to place the Xylem logo on any background as long as it provides sufficient contrast and legibility. Avoid busy and high contrast areas of images that interfere with the readability of our signature, or solid colors that are too similar to the logo color. A solid white background is preferred. The Xylem logo has been carefully drawn to represent the Xylem brand. The artwork should not be altered or modified in any way. The samples on this page do not illustrate every misuse, but the general guidelines that they represent can be broadly applied when working with the Xylem logo. Do not use the logo without the tagline unless the application would cause the tagline to be too small (e.g. embroidery or pen). Do not translate the tagline. Do not use the logo in an unapproved color. Do not distort the logo. Do not place the logo on a competing background. Do not resize any part of the logo. Do not add graphics to the logo. Do not rearrange any elements of the logo. Do not place the logo at an angle.